In the street of J. Abad Santos, popularized by everyone's favorite tea place Serenitea, lies a small restaurant called Chicken Charlie. Their branch in San Juan opened last November 2010, seconding to their first baby in Banawe. I've got the chance to try it out for take out last December and recently for dine in, which I want to share with you all. Parking can be a challenge, since the space is small. Only about a car or two can park directly in front of the restaurant. I'd suggest going there at night, so closed stores nearby can be used for extra slots. Or you can also try parking in Serenitea, buy a drink, and bring it to Chicken Charlie (needless to say, you need to order, okay?). Entering the restaurant, we can see a number of tables, chairs and couches, which I find spacious and uncrowded. For smokers, you can utilize a couple of their tables and chairs outside for dining as well. With a simple counter and a few items on the menu, ordering becomes a breeze! The menu's illustrations are really mouth-watering and tempting. Pictured above are partner owners -- guy wearing army green-colored shirt and girl wearing white polo. 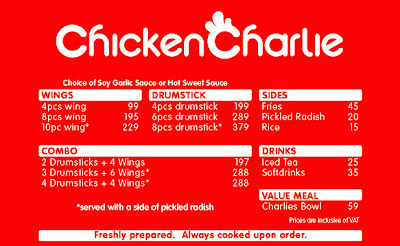 I ordered their combo of 2 Drumsticks + 4 Wings for Php197. Price isn't bad, in my opinion. With a choice of Soy Garlic Sauce or Hot Sweet Sauce, I chose the former because I'm more of a non-spicy person. Chicken Charlie boasts of 5 reasons why their chicken is so good: (1) 0% trans fat, (2) freshly prepared and always cooked upon order, (3) perfectly non-greasy, (4) extra-ordinary taste, (5) frying technique takes a significant amount of fat out of the chicken and makes it extra crunchy. I would have to agree on all of the above, except for #3. As the term "fried" chicken, it will never be non-greasy -- just less greasy compared to other fried chicken. Since it's freshly fried upon order, the waiting time can take about 15-20 minutes, which is just okay for me since the chicken is very tasteful, not dry, and crunchy on the outside. Panalo talaga! For our recent dine in, we ordered drinks from Serenitea and brought it over to couple it the same combo as above. We didn't order rice anymore, because the chicken and drink alone made us so satisfyingly full! I love it! Oh! If you're a spicy food lover, you might want to try out their Dynamite (8pcs for Php88), which I saw from another customer. I assume those are huge chili sticks covered with lumpia wrapper and dipped on mayo-ish sauce. Looks yummy, but seems quite a challenge to finish. For your reference, here's their menu (taken from their website) less the desserts and some sides. Finally, the owner told me that the Retiro-Banawe branch is moving to a bigger and better location. Visit their website and Facebook page for updates on when the new branch will open. Update - Chicken Charlie now has Fish and Fries! Read about here. We don't have this here at Malaysia, but have Popeye's fried chicken and the usual KFC. This looks like the Chinese version of Kentucky fried Chicken with a menu like "In and Out buger". I'm a huge fan of simplified menus!